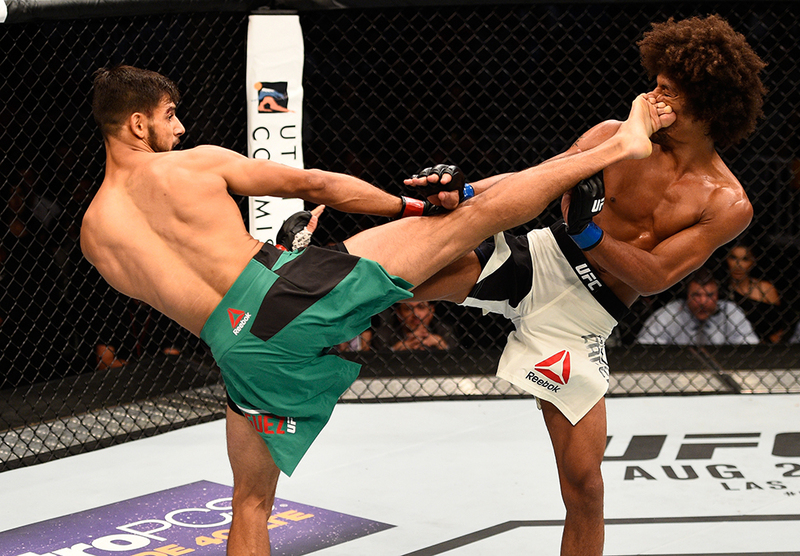 Yair Rodriguez went up against his spitting image in Alex Caceres Saturday night in Salt Lake City: an ultra-athletic, creative striker who likes to throw spinning ninja kicks. “El Pantera” passed the toughest test of his UFC career, improving his record inside the Octagon to a perfect 5-0. Rodriguez vs. Caceres earned Fight of the Night honors and had the majority of the audience in attendance at the Vivint Smart Home Arena and those watching around the globe dizzy by the end of the bout. What was most impressive about Rodriguez’s split decision win (46-49, 48-47, 48-47) was his output, pace and cardio throughout the fight. He threw 431 total strikes in 25 minutes and still managed the same exciting output in the fifth round as he did in the first. Caceres proved to be the test most expected he’d be for Rodriguez. He landed 93 of his own significant strikes and patiently studied Rodriguez in the early rounds before timing his counters and increasing his effective striking in the later rounds. Caceres may not have been a Top-15 opponent, but Rodriguez likely earned himself serious consideration for a Top 10 spot at featherweight when the new rankings come out on Wednesday. Rodriguez’s five consecutive wins at 145 pounds is the third-longest active win streak in the division after Max Holloway (nine) and Conor McGregor (5). Next up for Rodriguez could be a Top 10 opponent. One name that comes to mind is No. 7-ranked Jeremy Stephens, and what a striking battle that would be. For Caceres, he showed that he is a game fight for anybody in the featherweight division. This will force him to take a small step back, but his cardio in a 25-minute fight held up against Rodriguez and he could get a top 15 opponent next. Another featherweight prospect who loves to stand and bang like Dooho Choi would be can’t miss fight. Cub Swanson was likely on the cusp of a title shot after six straight wins spanning from 2012 to 2014. A few quick losses to Frankie Edgar and Max Holloway, however, quickly made Swanson an afterthought in the featherweight division. So Swanson decided to step away from the sport a bit and recharge his batteries. He nursed a few wounds from the Holloway fight and refocused. He had to figure out how to enjoy the fight game again; learn how to take one fight at a time and not worry about what comes next. Swanson had his back up against a wall again against Tatsuya Kawajiri. He got rocked in the first round and was mounted on the ground at one point, but he remained calm and fought his way back to capture a unanimous decision win. Still ranked in the top five of the division, Swanson has a new win streak started and may be back on track to the top of the division. But he’s not sweating the details. He’s just taking one fight at a time.